"The CBI should take note of his flagrant violation of jail rules by making political comments through tweets", Sushil Kumar Modi said. Lalu Yadav's tweets have been critical of the government, especially in connection with the Rafale deal. Bihar Deputy Chief Minister Sushil Kumar Modi on Tuesday took strong exception to the "political comments" made on the official Twitter handle of RJD president Lalu Prasad Yadav, who is serving jail term in a number of fodder scam cases. Accusing Mr Yadav of "playing politics from jail", Mr Modi urged the Central Bureau of Investigation to take note and apprise the court of his activities. "Convicted in four fodder scam cases, Lalu Prasad can, during his sentence period, neither contest elections nor issue political statements. The CBI should take note of his flagrant violation of jail rules by making political comments through tweets. The agency should bring it to the attention of the court. 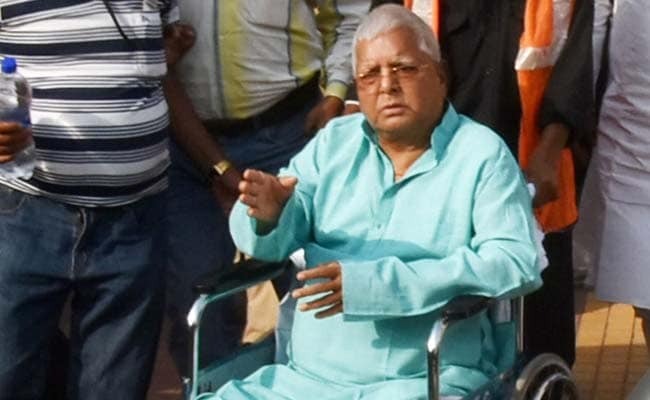 Lalu Prasad is doing politics from jail," the deputy CM tweeted. The senior BJP leader's outburst comes in the wake of tweets severely critical of the Narendra Modi government on the Rafale deal which appeared on Lalu Yadav's official Twitter handle recently. The Twitter handle is said to be managed by people close to the Rashtriya Janata Dal (RJD) supremo. Meanwhile, the Bihar deputy chief minister drew flak from Opposition leaders on his reported statement in Gaya on Sunday, where he "with folded hands" urged criminals of the pilgrim town to refrain from anti-social activities during the ongoing Pitri Paksh Mela. A day after RJD heir apparent Tejashwi Yadav mocked Mr Modi's statement and said the latter could soon fall at the feet of criminals, Nationalist Congress Party (NCP) general secretary Tariq Anwar termed the statement as "shameful" and antamount to"abdication of responsibility". "It seems the Bihar government has completely lost its grip on law and order. We wonder what has happened to Chief Minister Nitish Kumar's proclaimed zero tolerance towards corruption and crime when his deputy is cutting such a sorry figure," Mr Anwar told PTI.